Another week another Friday Favourites, this past week has been rather quiet compared to previous weeks and due to the rain my early morning walks haven't been happening so I have been enjoying staying in my warm bed :) I love the rain and hearing it on the veranda is the perfect sound as I drift off to sleep. Of course Tuesday I had my job interview and I will find out next week if I have the job or not, a recap of the interview can be found here, if you want to know how I went. I am just giving it to God and continuing to pray that if it's the right job then God will help me ease into working life, and if it's not the right job he will comfort me and show me what my next step will be. My anxiety has been showing itself because of the interview so feeling jumpy/on edge is now a normal part of my day at the moment! I am thankful that new episodes of Good Witch are on Netflix so it's been nice curling up on the couch and escaping for a bit. Last Saturday night I had a murder mystery party to go to for my cousin's 18th, which was fun. I had no idea what to dress up as (the invite said, jillaroo, outback animal, criminal, serial killer, police officer, backpacker or other outback themed character) and my original plan was to wear my flannelette shirt and go as a jillaroo but I soon realised that that had paint on it and I really didn't want to buy a new one for the sake of the party. Thankfully I remembered that one of my wardrobe staples is a trench coat and a quick Pinterest search gave me the idea of becoming a detective. I borrowed a magnifying glass, spent $3 on a reporters notebook, carried a small torch, wore all black (my trench coat was black, so just wore black jeans and a black long sleeved top) including high heeled boots and finished the looked with red lip tint and my glasses. I have to admit I looked really good, it took me no time at all to put it together and only cost me $3 out of pocket. 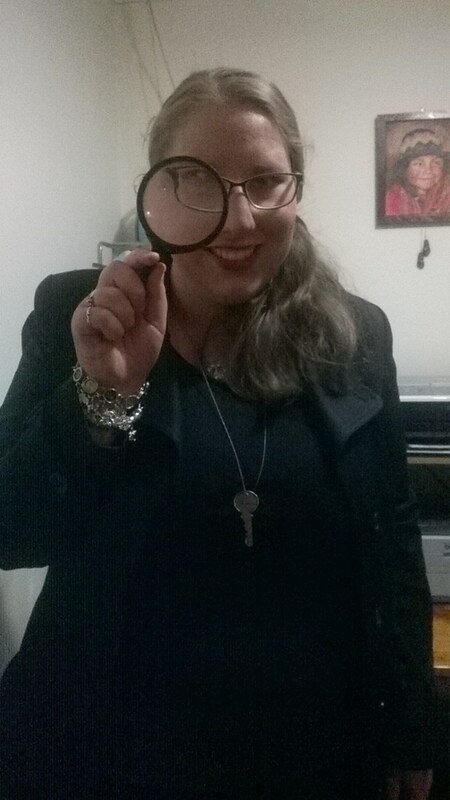 It was fun to channel my inner detective for the night and I had loads of fun. Power Rangers - I was stoked when this was released last week on dvd and bought it immediately. I really enjoyed the film despite it not being something that I would typically watch. I loved the characters and how they were all people from different backgrounds who had to work together to save the earth. If you have a movie night coming up and are unsure what to watch I highly reccomend it and the chances are everyone will enjoy it regardless of the genere that they prefer. Dance Academy: The Movie - another awesome film which is out on dvd! I loved this film so much that I even saw it twice in the movies. It was great to reunite with Tara and the rest of crew and see how much they had grown and matured since their time at the academy. It's an amazing film and if you loved the series (and if you haven't watch the series then get to watching it! ), the movie is a must watch. ReachOut.com Revamped - ReachOut.com has had a makeover and it looks amazing! Its so much easier to use and makes it easy to navigate to the parent specific and school specific sites with links up the top of the pages which contains a wide range of information and tools to help them understand mental illness in young adults. I was able to have a sneak peak at the new forums during the process and so while I knew what they would be like the rest of the website was surprise. I am a bit fussy when it comes to websites and if they aren't user friendly then I won't use them, ReachOut was great before but now its a whole new level of awesome. Plus its easier to use on smartphones now too, as ReachOut understands the need for young people to be able to access it 24/7 no matter where they are (this was one of the reasons for the revamp). If you haven't checked out the new version of ReachOut.com I highly recommend you do. To learn more about the revamps and changes ReachOut has made to their website click here for all the information (and to see some awesome gifs!). Degrassi: Next Class season 4 - if you need me this weekend I will be watching the latest season of Degrassi: Next Class and then once I am finished watching it rewatching it. Degrassi is my all time favourite show, if I need a pick me up I watch it, if I need an escape or distraction I watch it, if I want to cry I watch it, if I want to laugh I watch it, if I can't find anything to watch I watch it ... You get the picture. I started watching it in high school and I haven't stopped watching it. This season looks amazing and should be filled with ups and downs. Degrassi: Next Class season 4 comes out on Netflix either the 7th or the 8th of July depending what timezone your in. Game of Things - you get given a topic and everyone has to write something related to it down and you then have to guess who wrote what. It sounds like a good ice breaker game for a party and is bound to bring out some laughs. Fluxx - (original one linked but I have the Zombie Version) - the card game of ever changing rules! A friend played it and told me about it so I decided to buy a copy for myself. There are so many versions out there including: pirate, star, zombie, Monty Python and Oz (as in Wizard of Oz) just to name a few! Each have the same base rules but with different action cards, I chose Zombie because why not? But they are all bound to be fun. What Do You Meme? - I have just ordered it so have yet to see it in person, but it looks like Apples to Apples but with memes and as a millennial my friends are all obsessed with memes! It should bring a few laughs and will be fun to see what type of memes they have included (I am hoping for some funny cat ones). Spoiler alert! Interview wasn't successful.